Today IV formers will be starting in earnest on their Transition Year Extended Essays, which are due in by Wednesday 17th November. I highly recommend this book because it is about love, not those typical human relationships, but man and animal relationships. 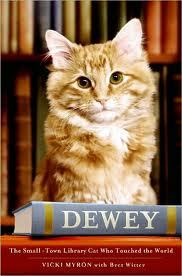 Dewey was a kitten that was abandoned in the cold winter morning of of Spencer, Iowa. The library staff saved and rescued Dewey, and ever since he was grateful to the small things that we take for granted, as he was at the doorstep of Death, if people hadn't rescued him. The library staff decide to take Dewey under their wing, and his 'Mom', Vicki Byron, needs Dewey as much as Dewey needs her because she had been suffering from breast cancer (now fully recovered) and was divorced from her ex-husband who was an alcoholic. Dewey comforts Vicki, and comforts those who visit the library too, being a friend, and a listener. Dewey isn't just a normal cat, he is an extraordinary one, and it is a heartwarming story about a cat who cares about people around him, and funny incidents that happen. It is a very touching book.